MIchael Bayley, President and CEO, Royal Caribbean International, and Richard D. Fain, Chairman and CEO, Royal Caribbean Cruises Ltd.
SAINT NAZAIRE, FRANCE — Built at a cost of more than US$1 billion for 5,479 guests in 2,747 staterooms, and weighing 227,000 gross registered tons, Harmony of the Seas was unveiled at a delivery ceremony yesterday in Saint Nazaire, marking the debut of what will be the 25th ship in the Royal Caribbean fleet. Following 32 months of construction at the STX France shipyard involving thousands of shipyard employees, sub-contractors and suppliers, Harmony of the Seas is now home to 2,100 crew members from 77 different nationalities. 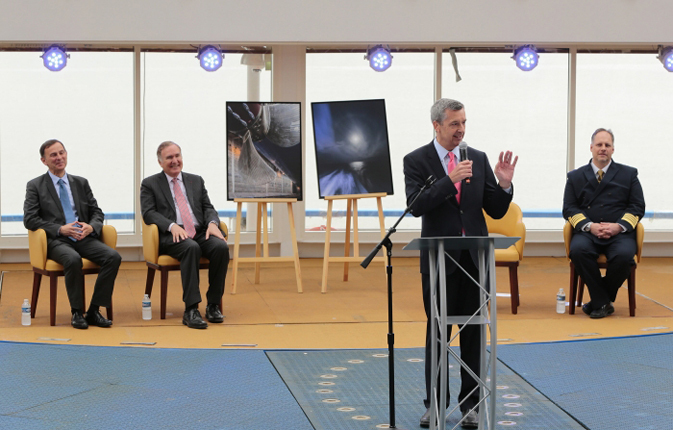 Joining the festivities in the ship’s AquaTheater were Richard Fain, Chairman and CEO of Royal Caribbean Cruises Ltd. and Michael Bayley, President and CEO of Royal Caribbean International together with Laurent Castaing, General Manager, STX France. 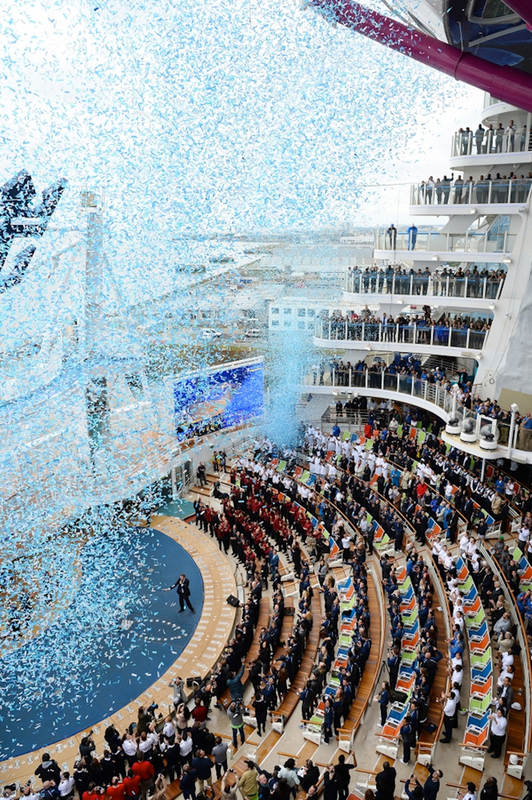 Harmony of the Seas Delivery Ceremony. MIchael Bayley, President and CEO, Royal Caribbean International. VOOM, the fastest internet at sea, available exclusively to Royal Caribbean guests, which allows travelers to seamlessly stay connected, stream their favorite entertainment, video chat and share their adventures with friends and family at home. Harmony of the Seas will homeport in Barcelona and embark on the first of 34 seven-night sailings in the western Med on June 7. In November 2016 Harmony will arrive at Port Everglades, FL for seven-night eastern and western Caribbean sailings. The newest member of the fleet will join sister-ships Oasis of the Seas and Allure of the Seas, sailing from Port Canaveral and Port Everglades respectively, on the east coast of Florida.